Military forms an integral part of a country. Without a military, the people of the nation cannot live in peace and safety. Military is responsible for the security of the country and work tirelessly with selfless motive and pride. Every soldier in the military is the personification of sacrifice, bravery, courage and dedication. They stay away from their family, with only the safety of the nation in mind. Every soldier in the military has to be saluted by all the citizens and given the highest respect and honor. The strength of a country’s military depends not on the number of the soldiers but on the courage they possess. As General Eisenhower said, “What counts is not necessarily the size of the dog in the fight-it’s the size of the fight in the dog”. Great military leaders and the last in the rank and file of the military have made great contribution in so many wars which have not surfaced and heard by ordinary men. We salute them all. 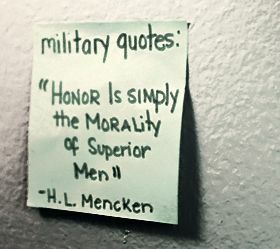 Here are quotes on military, read them; they are awe inspiring.